If God was running for election, what would be His agenda? Would He provide better health care or teach you how to take care of your own health? Would He create more jobs or give you more purpose and meaning for your life? 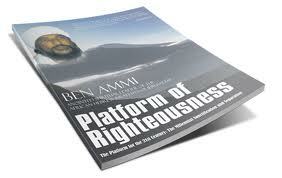 This writing introduces you to a platform for the true salvation of the people. It is crafted to ensure the formulation of a world that is in harmony with the will of Yah (God). This harmony can only be accomplished by entering into a divine social contract whose guiding principles are, in essence, the building blocks established by the Most Holy for the preservation of man and his environment.